Microsoft has given up on Windows 10 1809, the troubled feature upgrade of last year that was delayed by months, data from an analytics vendor showed. The Redmond, Wash. developer largely abandoned efforts to distribute the October 2018 Update, aka 1809 in its four-digit yymm format, last month, apparently deciding that it would, like many of its corporate customers, simply skip one feature upgrade to solve the problem of two on a collision course. According to AdDuplex, a Lithuanian company whose metrics technology is embedded in thousands of Windows Store apps, Windows 10 1809 powered just 26 per cent of surveyed Windows 10 systems as of 26 March. The gain from February to March, only five percentage points, was about half the increase from January to February, illustrating the slowing of 1809's adoption. "It looks more and more likely that Microsoft seems to be giving up on  in favour of upgrading users straight to the next version," AdDuplex noted in a post its website. Because Microsoft decides how quickly an upgrade is adopted by controlling when consumers' PCs automatically download and install each refresh, it was clearly responsible for the slow uptake. Microsoft did not give 1809 the "business ready" green light until after AdDuplex's data collection, ensuring that those who had installed it were largely consumers and very small businesses running Windows 10 Home or Windows 10 Pro. Microsoft controls the timing of upgrades on unmanaged PCs powered by those versions. The dramatic slowing of 1809 adoption - when it should instead be accelerating - answered a question Computerworld posed last month: How would Microsoft address the problem of two upgrades released in close proximity? The problem stemmed from the fiasco plaguing the October 2018 Update rollout. Although 1809 was initially released on 2 October, within days Microsoft purged it from the distribution pipeline because of upgrade-caused data loss. The company quickly returned 1809 to beta testing, and automatic dissemination didn't resume until 16 January, or about three months later than by a standard schedule. Because Microsoft forced Windows 10 Home users to accept feature upgrades when they were offered, the regimen was on an every-six-month cadence. But with 1809's automated distribution backed up by three months, the arrival of 1903 this spring was going to be hard on its heels. The company had to do something. Computerworld assumed two likely responses: Either Microsoft would require users to run 1809, no matter how briefly, before upgrading again to 1903, or Microsoft would skip 1809. AdDuplex's analytics indicated that Microsoft picked Option no. 2 no later than early March, when it must have begun slowing auto-delivery of 1809. Microsoft now plans to push out 1903 in late May. Microsoft made more than one move to quash Windows 10 October 2018 Update. First, it began to shut off the 1809 distribution spigot, slowing its adoption by unmanaged PCs running Home or Pro. That left the bulk of Windows 10 PCs powered by 1803, last year's spring upgrade. AdDuplex's March tally said that 66 per cent of all Windows 10 systems ran 1803. It could have stopped there, enforcing the "no-1809" rule simply by refusing to release it to eligible PCs. Managed machines running Windows 10 Enterprise, Education or Pro were, as usual, in the hands of organisation IT administrators, who could be expected to skip the late-coming and problem-plagued 1809. But Microsoft also announced that it would upend the update rules by giving owners of previously-unmanaged PCs - Windows 10 Home and Pro - the ability to manually manage feature upgrades. That pronouncement, made last week, spelled out a new update option, "Download and install now," for users of Windows 10 Home and Pro who rely on Windows Update. The option will let users decide when to download and install a feature upgrade; Microsoft will only intervene and initiate an auto-install when the version on the machine "is nearing end of support." "Download and install now" will be included with Windows 10 1903, but will also, Microsoft said, be added to 1803 and 1809 "by late May." In other words, users can themselves determine what version of Windows 10 they're running - within limits of support - rather than bending to Microsoft's will. Someone still running Windows 10 1803 in, say July, will be able to skip 1809 entirely by calling up "Download and install," which will then deploy the latest version, Windows 10 1903. 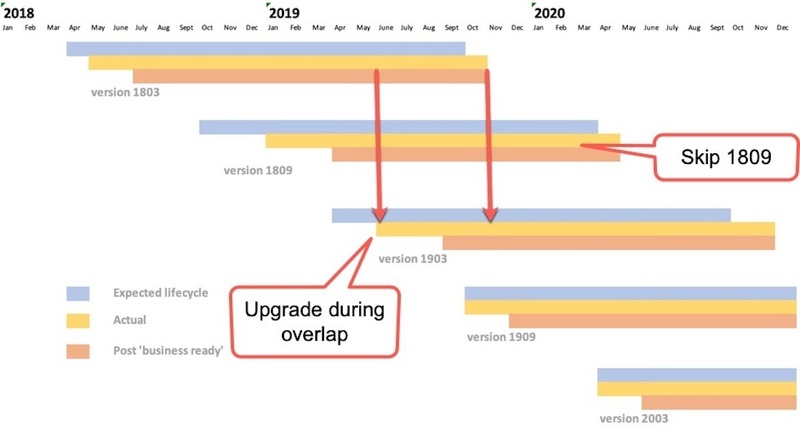 As Figure 1 illustrates below, those running Windows 10 1803 will have several months - June through mid-November, when 1803 exits support - to leapfrog 1809 and install 1903. Figure 1: Users of Windows 10 1803 should have five months to make the move to 1903.